It should be noted that many of the textiles of the past cannot — let me repeat that, CANNOT be reproduced by industrial methods. And that many of the techniques are lost to history, thanks to the advent of industrialized textile production and the accompanying slave labor market it produced. It’s interesting how people jump to spinning and weaving as a response to the threat of energy decline. Both seem poor investments to me (I should speak softly here, my wife is currently away at a fibre crafts fair). They are fun, but are only ever going to be hobbies. Consider that a spinning machine (that draws the fibre and spins into even thickness multi-ply yarns) is something that can be built by a knowledgeable blacksmith or carpenter in a day or two. 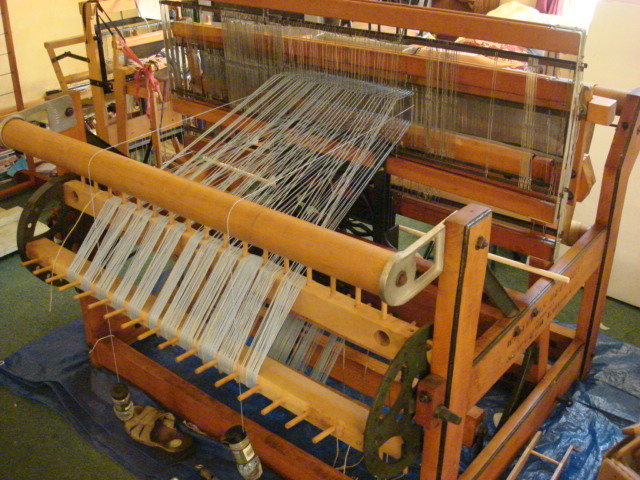 A mechanised weaving loom can be built with 18th century technology. Automated knitting is 19th century as are sewing machines. But what we still haven’t made machines to efficiently do is make clothes. So it would seem prudent, while we have a supply of cheap fabric, to learn how to efficiently make efficient clothing. And it’s actually fun. What got me started is the fact that I am very long in the body, so off the shelf clothing is either baggy or midriff. I’ve made tee-shirts, underwear, polar fleece tops and bike riding clothes using nothing more than a bottom of the range sewing machine and some simple long life low tech tools such as the humble stitch unpicker. There are some major problems with this point of view. One is that it isn’t cost effective to make one’s own clothing, and one should make clothing out of other clothes. The other is implicitly contained in this comment and is that producing textiles isn’t worthwhile enough to bother with and shouldn’t be considered by anyone contemplating energy descent. Another is that machines can be more efficient than a human being. And a final, not insignificant one is the assumption that these fabrics he plays around with making his own clothes are going to continue to be readily available in the future. Now, from the point of view of modern industrial textile production, this gentleman is right. It’s NOT cost effective, not by a long shot, to spin the yarn/thread and weave one’s own fabric. Nor, in the long run, is making one’s own clothes. But there is a hidden cost involved in buying textiles produced by the industrial method, and that is that there is a family caught up in the slave labor market, weaving for 16 hours a day or longer, usually by kerosene lantern in poorly ventilated areas, making that cheap textile that is the raw material for your clothes. Those fancy spinning and weaving machines are too expensive for use by these families in India, Pakistan, etc. so guess what they weave on? 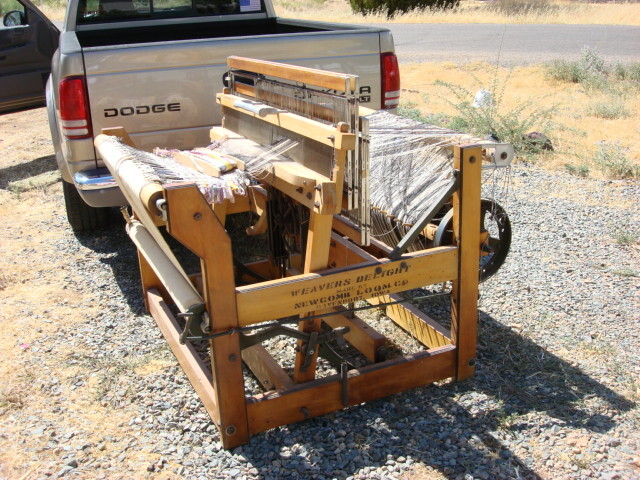 You guessed it, a hand loom. Back to my introductory paragraph. This idea that people ‘toiled’ making the raw goods into usable product I think it mostly wrong. And the idea that these people only did this, is very wrong. You see, the industrialized idea that all things should be made as a thing unto themselves, away from all other activities of living, is the problem. That’s a new idea. It’s really less than 300 years old, and violates the entire path of human history. The reality is that most of those textiles were produced in neighborhoods, if not homes, in the context of daily life, with the ability for the makers to interrupt their processes for things like children crying, daily chores, cooking, cleaning, and so on. If a weaver had a shop, it was usually connected with his workshop, which was usually close to his/her home. The spinners worked at home, in snatches of time as it was available; children learned to spin at the ripe old age of four or five. Now, for the most part, prior to the advent of the industrial mindset, this was a skill they did NOT spend their entire day doing, but they would have a certain amount of work to be done before they could play, just as modern children should have chores they must complete, along with homework, before they are free to play. Work was integrated into the home. All work was integrated into the home. And the home was integrated into the work life. Yes, of course, there were markets. But the merchants purveying goods at these markets did so while buying from recognized traders, or from local craftspeople. And because the products were produced at home, as part of the production of a home, the idea that they should be monetized and made ‘efficient’ by modern standards would have been ludicrous to those ancestral textile producers. Yes, people made their livings from these things, but in the context of all the other things they did to live, not separately. Just as a farmer traditionally sold the extra he had after making sure the family was fed and possibly raising a cash crop on the side, most textile workers worked from home, producing for their own families’ needs first, then producing the luxury textiles that were sold. There is an idea contained here in his statements, I believe, that conveys the perception that these crafts can only ever be hobbies because they are done from the home — that ‘real’ work involves going somewhere else. I believe, on the contrary, that what makes these viable livelihoods IS the fact that they are produced from home, in the context of daily life. If one doesn’t need to calculate the costs of commuting, renting a shop, etc. but calculates instead a price based on time to produce, and costs of materials, the analysis changes into something more resembling the history of the textile trade. The idea the gentleman proposes, that these machines can be made simply (and probably cheaply) by a skilled blacksmith or wood worker, betrays his ignorance of the level of technology that goes into a spinning wheel or loom. In fact, they are high technology items, and you are not going to get one made cheaply by anyone who values their time and skill. I think buried somewhere in his statement is the idea that these machines somehow do their work without the input of the human being running the machine — which doesn’t happen in the home setting(or in the areas of high textile production like India or Pakistan), and which uses fossil fuels to boot. A spinning wheel doesn’t make yarn without the human to appropriately feed the fiber in, to treadle the wheel, and to ply and finish the yarn after it’s spun. A loom doesn’t warp itself (even big industrial ones! ), doesn’t choose the pattern, doesn’t feed the shuttle across the warp, and decide if it’s appropriate for this or that use when it’s done. These things take human beings. My loom is nice, but it isn’t necessary to weave beautiful, practical items. A backstrap loom, or foot loom, where the weaver’s body is what keeps the tension, have been in use for literally thousands of years — the Egyptians wove linen at a fineness that simply can’t be duplicated now — using nothing more than a foot loom. They spun their linen at a thinness so fine that it was one fiber thick using a glue to piece it together at each end of the fiber, on a drop spindle, that can’t be reproduced now because we no longer know what they used to glue the pieces together. 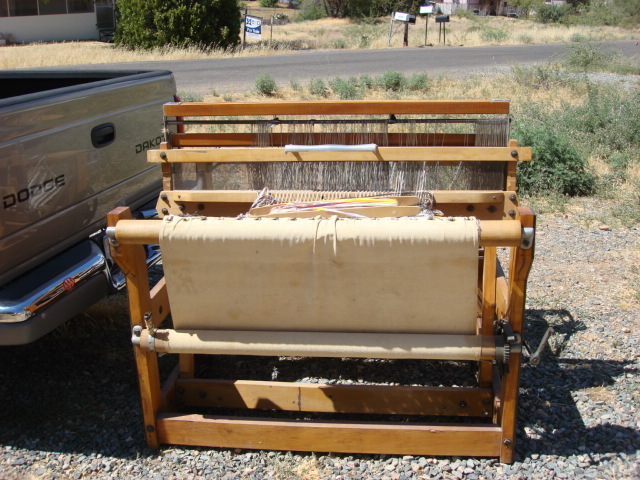 The Indians spun silk at a similar fineness, also using nothing more than a drop spindle, at a fineness that one cocoon could literally make a mile or more of thread. Where does this gentleman think the raw materials come from? They come from farmers and herdsman. When you get right down to it, these are activities that require human input. In the case of herding, a lot of human input. There is no machine ever made that will shear a sheep by itself, nor an alpaca. There is no replacement for the hand work of the Irish flax farmers who produce the world’s finest linen. Now, admittedly, there are machines made that do use fossil fuels in order to make certain processes more efficient — the cotton gin comes to mind for one — that are a godsend to those in the fiber industry, both craft scale and large scale. Cotton, now ubiquitous in everyday life, was once a luxury fiber due to the heavy human involvement in the time consuming process of removing the seeds from the boll before it could be used. In fact, the cotton gin is one of the reasons that the Civil War was able to be won by the North — thousands of slaves were no longer needed to process the cotton by hand. Polar fleece is a fiber that is completely dependent on fossil fuel production. I can think of many more that are also completely dependent on fossil fuel production. From raw material to finished product, they are a child of the Industrial Age. As fuel becomes more expensive, these fibers, and the items made from them, will also become more expensive. In fact, all textiles will become more expensive; there isn’t going to be the money to pay for textiles to be made in one third world country, shipped to another for the manufacture of cheap clothing, and then shipped to Western nations for consumption. I worry for the poor providers of the cloth; what will happen to their livelihoods as the demand drops? So to his idea that the skills of weaving and spinning and making clothing (couturier) will never be anything more than hobbies, I have to take issue. Admittedly, in the next ten or twenty years they may never be anything more than hobbies to those of us in the comfortable West, but in the nearer rather than farther future, these ‘hobbies’ will become once again integral to daily life. The supply of used clothing will run down, and the need for these skills will ramp up. Guilds, revived in the middle of the 20th century as a way to share knowledge and skills, will once again become necessary to regulate the commerce in textiles. I consider myself one of the keepers of (mostly) lost arts/skills for the future generations. And I spin, knit, crochet, sew, dye, and weave much as my ancestors did — in between other activities of daily life. If only my paying job was at home as well. This is my new loom. I acquired it yesterday, and it is still sitting in the same place in the driveway as it is too heavy (and too bulky) to get up the stairs of the deck and into the front door. It’s covered with tarps because the monsoons are here (yay!!) finally, and it rained yesterday. It has an approximate 45 inch weaving width; I haven’t measured it yet but it’s a little larger than a yard across so that’s what I’m guessing. Also, from the research I’ve done, that’s the ‘standard’ width for these machines. 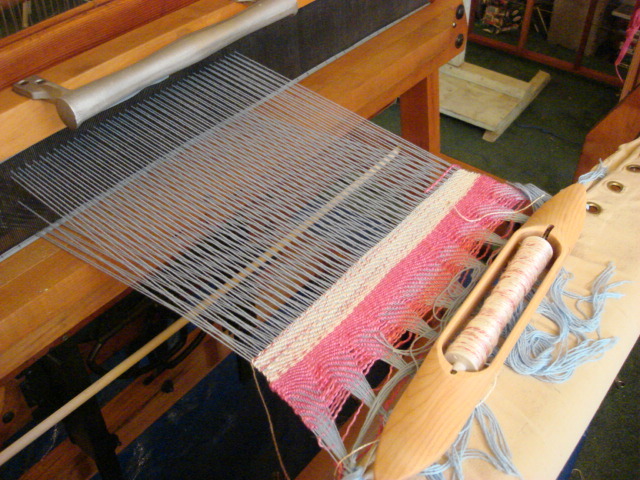 It’s a loom designed for making rugs and blankets, but you can make other things as well. It has a unique operating mechanism — as you can see from the picture, it has no foot treadles. That’s because it is a ‘semi automatic’ loom. There are interchangeable cams that create the weaving pattern by changing the thread pattern as you move the beater bar forward and back. Supposedly this loom also came with a shuttle that would race across as you moved the beater as well. This loom does not include that, as far as I can presently tell from the box of accessories. Unfortunately, the loom only came with the cams that are presently on it; I have sent out several emails to people listed on the internet who might have access to parts or know of someone who does. I was able to find a pdf link via the University of Arizona (go Cats!) for the loom manual circa 1910. This might seem pretty old, but this particular loom was patented and manufactured by the Newcomb Loom Company from the 1800’s through 1983 without anything other than minor changes. There were over 35,000 made, and one can tell the age by the serial number (I haven’t researched that yet). What did I pay for this? $65 approximately plus a day of time. $40 for gas for my FIL’s truck, $20 for lunch, $5 for the pdf file to be printed and bound at Staples. So I figure, like with my other loom, if it costs money for replacement parts, I’m still ahead of the game. The family offering it on Craigslist basically just wanted it out of their garage. I was happy to comply. Well, off to work with my tools to start disassembling. Thankfully the manual includes, on the back cover, “how to get the loom into the house” directions for partial disassembly. AZ Central had this news to report in May: the speed camera contract was not being renewed; the Cameras will not run after July 15. That WAS good news. The contract was not renewed with Redflex, the Australian-based owners of the cameras and the biggest dealer of speed cameras in the world. Really, this was good news. It meant that, even though less than 30% of all photo tickets were paid, the ridiculous sums of money that speeding now costs in this state due to 60% or more going to fund the contract will not be leaving the country and enriching a foreign nation. I don’t know how many are aware that the reason the fines have become so expensive is that the camera contracts stipulate that the company will receive a certain amount of money from the cameras, which means that if people aren’t paying their fines the money comes directly from the state, unless they raise the fees to cover the costs of those who don’t respond and pay. The state still wants to use traffic laws (and the breaking of them) as a source of income, hence the most recent figure I heard for a speeding ticket: $470. This was the sum quoted by one of our local Hams at Field Day; he received a camera ticket outside of Prescott Valley on Hwy 69 and was supposedly doing 85 in a 55. Now, he DID admit to speeding, but he was shocked at both the rate of speed he was supposedly going (this is a guy in his mid 70’s, mind you) and the cost of the ticket. Then This story came out. It seems that the reason the contract is not being renewed is that DPS wants to take over the entire thing themselves, thus keeping all the money for themselves. Now, I have been robbed on more than one occasion. I have had an attempted breakin while I was home with my children, and had to threaten them with my rifle to make them go away, and to go outside with my rifle to make sure they both knew I was serious and to make sure they DID go away (they did). On none of these occasions have the police EVER found a suspect, found my stuff, or even attempted to do an investigation. So why would I care if they get more money or not? They only seem to ever want to prosecute the easy money stuff….like traffic violations. And hey, why even do that when they can just put up cameras every two miles on the interstate to do that work for them as well? What is with the cameras every two miles, and how do I know that, you ask? Well, I drive 60 miles one way to work, and about 50 miles of that is freeway. There are always at least two of the (now) unmanned photo radar SUV’s parked along the side of the interstate, and I have noticed that there are now, from New River south to I think it’s Dixileta Dr. the sensors in the newly upgraded road, every two miles. There is one stretch, where they could not conveniently mount a camera, where it goes to three, and another where it’s just over a mile, but pretty much it’s every two miles. I predicted in previous posts that there would be more of this, because of the lack of money and the strain on the system. I also predict here and now, that the stresses of people just trying to get to work, and home, and live on less money than ever, on being inundated with these cameras and their attendant usurious fines, will push many over the edge;. In fact, I predict that vandalism of these cameras, should they go live by DPS and in the numbers I seem to see, will become the past time of many young and/or unemployed groups of people. Frankly, I wish them luck in their endeavors.